Thank you for visiting the She Changed Comics online resources! 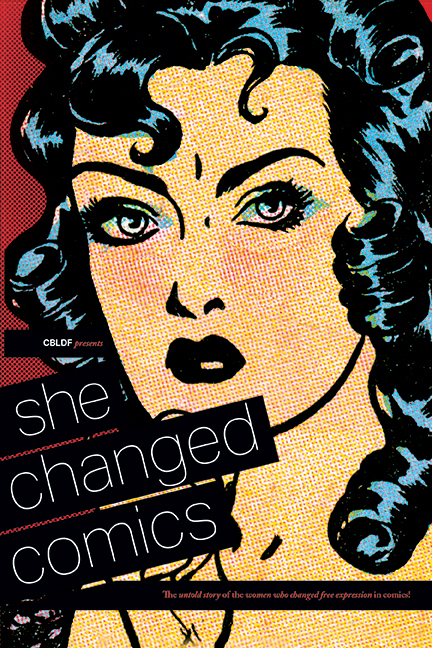 If you don’t already have a copy of CBLDF Presents: She Changed Comics, the untold story of the women who changed free expression in comics, you can pick up a copy here. We will be adding full-length interviews, references, teaching guides, and supplemental materials and hope to maintain this page as a resource on into the future! We appreciate your patience as we populate the page. If you have a concern or a suggestion for a resource, please email betsy.gomez@cbldf.org. Click here to download the Higher Education teaching guide (last updated March 31, 2017). Compiled by Trinidad Escobar. Click here to download the High School teaching guide (last updated March 31, 2017). Compiled by Betsy Gomez. Click here to download the Middle School teaching guide (last update March 31, 2017). Compiled by Betsy Gomez. The teaching guides are intended to be living documents, and we will update them regularly to add assessments and activities. If you have a suggestion for the guides or want to share a discussion question or activity you use in your classroom, let us know about it! Email betsy.gomez@cbldf.org with the info.